PAOLA — It was a quiet summer morning whose peace was interrupted only by the occasional sound of chattering voices, the rustle of garbage bags and a roaring leaf blower. What sounded like a typical lawn maintenance team, however, was anything but. These were teams of junior high and high school students from Holy Trinity Parish youth group. And they were offering up a “Day for Christ” — 24 hours total — in works of service. The youth gathered at Holy Trinity Parish each morning from June 4 to 8 to give back to God and the community. Luci Kennedy, the youth minister at Holy Trinity Parish and a teacher at the parish grade school, thought of the idea while brainstorming ways to help her group interact with the community and recognize that they make a difference in the parish and beyond. The chance to give a day for Christ posed both an opportunity and a challenge to the youth. Participants gathered at the church each morning to receive instructions on the work at hand. To start the week, the kids redistributed wheelbarrow loads of rubber chips across the surface of the playground. On another day, the volunteers gave the youth room a fresh coat of paint. Others helped run vacation Bible school for the young children the whole week. But on June 5, landscaping around the church and rectory was the task of the day. With nearly 20 kids present and ready to work, the group was split into two workforces: one at the rectory and another at the church. Patrick Lange, a senior at St. Thomas Aquinas High School in Overland Park, kept busy trimming limbs by the church, cutting vines and pulling weeds — all tasks he was happy to do for the church and community. 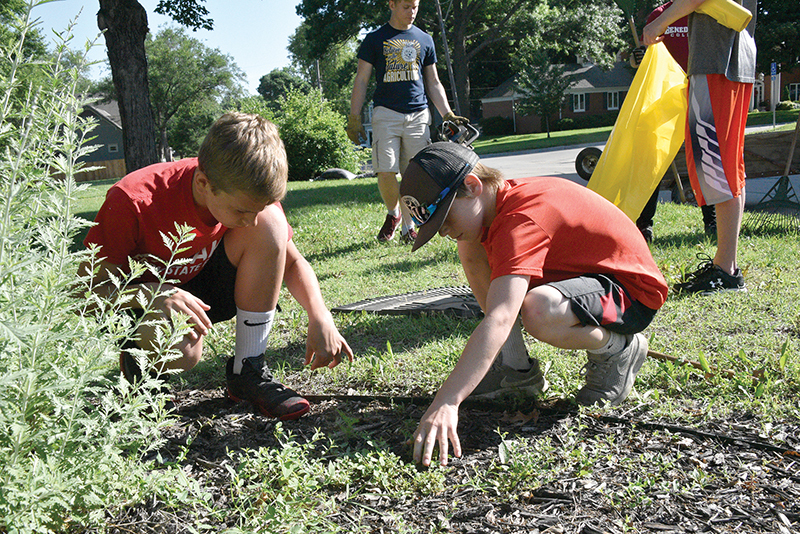 Mason Kubec, a freshman at St. James Academy in Lenexa, who was raking and pruning shrubs at the rectory, agreed. He added that the accompaniment of the parish youth group has been vital in this discovery. Lange has also seen how doing works of service as a result of involvement with the parish youth group has helped him mature. “It helps shape you as a person and gives you an idea of who you are supposed to be,” he said. Lange, who has done previous mission work in the Appalachian Mountains, has learned to recognize the value of supporting the community and the church through selfless giving. For Kennedy, organizing and supervising a Day for Christ has been just one project she’s enjoyed working on with the youth of the parish. “I think they’ve really helped me grow in my faith,” she said. But they sure don’t hold back — nor do they sugarcoat the questions they ask, said Kennedy. “Sometimes they’re brutally honest. But at the same time, they do make you think . . . and that’s been wonderful. The youth will complete their Day for Christ hours by the end of summer, helping the church and community and fulfilling the required hours for those receiving the sacrament of confirmation in the fall.